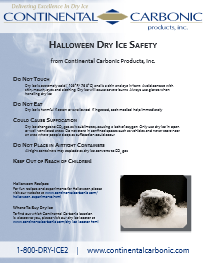 Make sure to follow all dry ice safe handling precautions. Fill a metal or plastic container half full of hot water and add a few pieces of dry ice every 5-10 minutes. As the water cools, you will need to add more hot water to maintain the fog effect. As a rule of thumb, one pound of dry ice will create 2-3 minutes of fog effect. The hotter the water, the more fog, but the quicker sublimation of the dry ice. 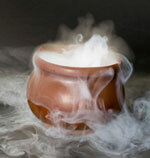 When you place dry ice into warm or hot water, clouds of white fog are created. This white fog is condensed water vapor, mixed in with the invisible CO2. The extreme cold causes the water vapor to condense into clouds. The fog is heavy, being carried by the CO2, and will settle to the bottom of a container. This can be poured out and produce enough fog to fill a medium-sized room with a pound or so of dry ice. Do not allow anyone (including pets) to lie in this fog because too much CO2 is toxic.